On some occasions you might need to incorporate parts of a Power Point Presentation in another or even merge several presentation files together. For instance, several heads of department may present their respective department’s reports and the slides need to be combined for easy filing and reference. Or the lectures and papers presented in a conference may make easier reference when combined as one. Of course you can open each presentation file, copy and paste to the other. This might take a bit of time if the files are huge in size and it is quite tedious if you have multiple files. To do quick merge of the Power Point presentation files, probably you can try out a small HTML Application (HTA) called PowerPoint Join. To use this application, firstly users need to combine all the presentation files into the same folder. Users thence need to create a text file (*.txt) that lists the name of the files to be merged. The text file must be in the same directory as the Power Point presentation files users are combining. Once it is done, users can use the application to browse the text file. Click on the “combine link” as shown in the photo to merge the Power Point documents. Users will thence be prompted a blank PowerPoint Windows. Close the Windows. Users can thence go back to the folder where the original Power Point Presentation files were stored. The merged file which is named as combined.ppt is kept in the folder. 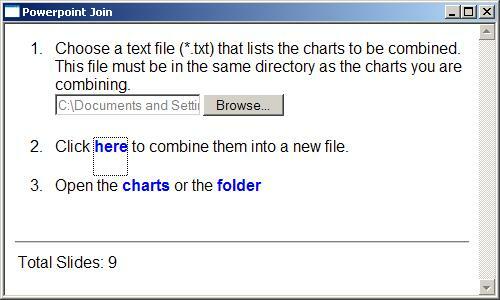 Users can open the combined.ppt file and they can see all the Power Point presentation contents inside.